Dental health is important part of our overall health and wellbeing. Not only does it keep our mouth functioning properly, and our teeth beautiful, but it can help protect us against a variety of serious health conditions including diabetes, heart disease, Alzheimer’s and even some cancers. However, great oral care shouldn’t just be a priority for the two-legged members of your family. Dental health is also a very important part of your pet’s overall wellbeing and looking after their teeth can help them to live a long, happy and fulfilling life. Which is the right professional to support me in looking after my pet’s teeth? Veterinary dentistry can usually be performed by any qualified veterinarian or board-certified veterinary dentist. 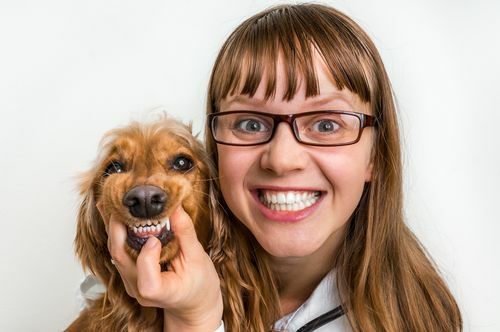 They are the best professionals to help you look after your pet’s teeth as they have the knowledge and experience to spot dental problems and recommend the most effective treatments. Periodontal disease is the most common dental condition seen in domestic cats and dogs. However, left untreated it can lead to chronic pain and assorted serious health conditions, including problems with the kidneys, liver and heart. Periodontal disease in pets is exactly the same as periodontal disease we experience as humans. It occurs when plaque and tartar penetrate below the gum line, causing infection in the gums and damage to the jaw bone that can affect the stability of your pet’s teeth. Infections in the gum can then spread into the jaw and surrounding tissue, and then through the bloodstream to your pet’s other organs, causing widespread problems. When periodontal disease is diagnosed, it is also graded from 0-4 depending on the severity of the condition. Treatment comes in the form of a deep, thorough clean of your pet’s teeth, including in the microscopic periodontal pockets which form between the teeth and gums. This will take place while your pet is under anesthetic so that they remain comfortable and unaware. Your vet may also consider it necessary to give your pet a course of antibiotics or other medication. How often should my pet have a dental check-up? Prevention really is better than cure when it comes to the health of any human or animal. By taking your pet for a dental check-up at least once a year, your veterinarian will have the greatest opportunity to catch any potential dental concerns – including periodontal disease - early, and treat them before they become painful, extensive or expensive. However, if your pet exhibits any of the following signs, or you have any other reason to believe that they may be experiencing dental problems, then you should make an appointment with your vet or veterinary dentist as soon as possible. What does a veterinary dental exam involve? If your veterinarian finds any indication of dental problems developing, he will then be able to talk to you about the best way to treat them. How can I support my pet’s health at home? Although veterinarians and veterinary dentists are there to provide expert care and attention when needed, there are steps that you can take at home to help look after your pet’s dental health. Regularly brushing your pet’s teeth using a vet-approved toothbrush and toothpaste at least several times a week can go a long way to maintaining their oral health. Your vet or vet dentist will be happy to advise you which are the right products for your animal. You should also ensure that you attend their regular check-up appointments, and follow through with any treatment that may be prescribed. Working with your veterinary team, it is possible to help protect the teeth and long-term health of your pet. Don’t delay, find out more today by contacting our office.